It is great to have a variety of local hometown newspapers scanned and online at your fingertips. This is the case for the ‘Historical Newspapers Online‘ done by Penn State. All the states are listed with the available newspapers, their locations, the years covered and any additional information. They have combined the national Chronicles Newspapers and the Google Newspapers for this one big collection. Besides all the states listed, other locations such as a variety of papers from Washington, D. C. and a few from the Virgin Islands. Some papers existed or their copy available for only a few years and others lasted nearly 100 years. Other papers centered around one town or city and others covered a region or district. You should check each listing in a specific state since a region may have a certain hometown you are researching. Knowing the county name of a hometown and surrounding counties will be helpful also. Click on the newspaper you wish to research. Instructions for each can vary. Not all issues for a certain year will be available. Look also for any search box with each. Most digital issues are done in PDF format, so they will need time to download. 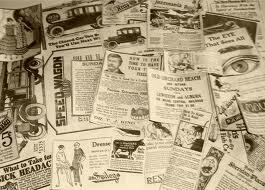 All types of items were printed in the paper – advertisements for businesses and professionals, legal notices, obituaries, social information, wedding announcements, etc. More from the late 1800s into the 20th century, there are illustrations and then photographs. You just never know what might be located. Besides looking for surnames, look up about historical events, especially as they were affecting hometown residents – such as World War I are excellent ways to learn of an ancestor’s life.